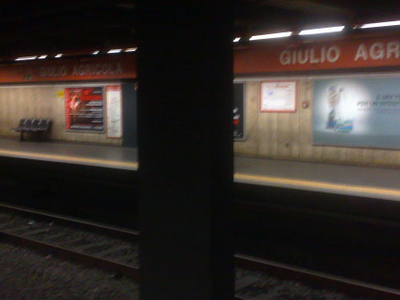 Giulio Agricola is an underground station on Line A of the Rome Metro. It is located on via Tuscolana, on the junction with via Giulio Agricola, a street named after Roman general Gnaeus Julius Agricola, in an area of Rome whose roads bear names of Roman commanders and consuls. The station is the setting for the short film Ultimo Metro with Debora Calì. If you watch the film the name of the station is clearly visible many times. Here's the our members favorite photos of "Metro Stations in Rome". Upload your photo of Giulio Agricola!